WIN PRIZES just for giving us a REVIEW. 5 Grand Prizes: We will draw 5 “bigger” prizes from all the names that gave a review. You can you name in the hat up to three times for helping us with all three reviews. What’s in it for GYIS: We understand how important reviews are for people who don’t already know, like and trust us. Having more reviews will help add credibility to folks looking at our information online. How: Just follow the steps below to write the review(s) then comment on the GYIS VIP Group Facebook Post Here that you wrote 1, 2 or 3 reviews to make it easy for us to track. 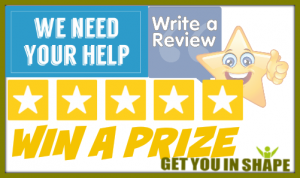 From now until February 8th we are giving away prizes for helping us increase the numbers of reviews that we have on Google, Facebook and Yelp (Yahoo). It’s pretty simple, you help us with one review, two reviews or all three reviews and you will get a packed of Spark from us. 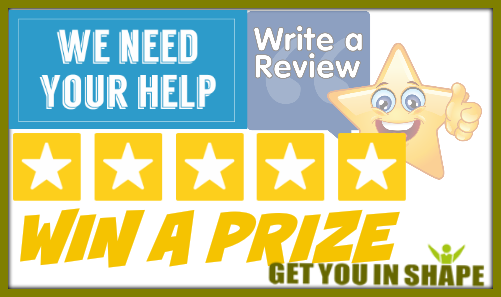 Your name will also be entered into a drawing for each review you make to win a few prizes. To make it easy for us to track, just comment on the post about the Promotion for Reviews on our GYIS VIP Group. Just comment that you wrote a review, 2 reviews or all three reviews so we know how many names we need to add in the hat. EVERYONE will get a packet of Spark for helping us with at least one review. There are some “how to’s” below since it is a little tricky to figure out how to write a review. Facebook and Yelp are pretty straightforward but it’s a little tricky to write a Google review, which is probably the one that will help us the most. We know that many people that are looking to get in shape find are a little intimidating so REVIEWS are the first place people look to check out the business. Thus, for a small business competing against similar businesses in the same city, reviews can often be the crucial tiebreaker between equidistant businesses. 3) We certainly want to hear all the benefits that our program has done in your life (awesome trainers, community, weight loss, energy, etc) . Suggestion that would help us- Use the words Coppell and Personal Trainers in your review since that is where we are and what we are. It’s certainly not a requirement as we just want some honest reviews on how GYIS has helped you. 4) Copy the first one review you use and just paste in the two other reviews. Scroll down and you will see REVIEWS on the left side. You just click on the 5 stars and write a review. 3) Yelp Review (Yahoo) – Go here to write a review on Yelp (Yahoo). After you write the review or reviews, you will then comment on the GYIS VIP Group Facebook Post Here that you wrote 1, 2 or 3 reviews to make it easy for us to track. THANK YOU IN ADVANCE FOR TAKING SOME TIME OUT TO WRITE A REVIEW.